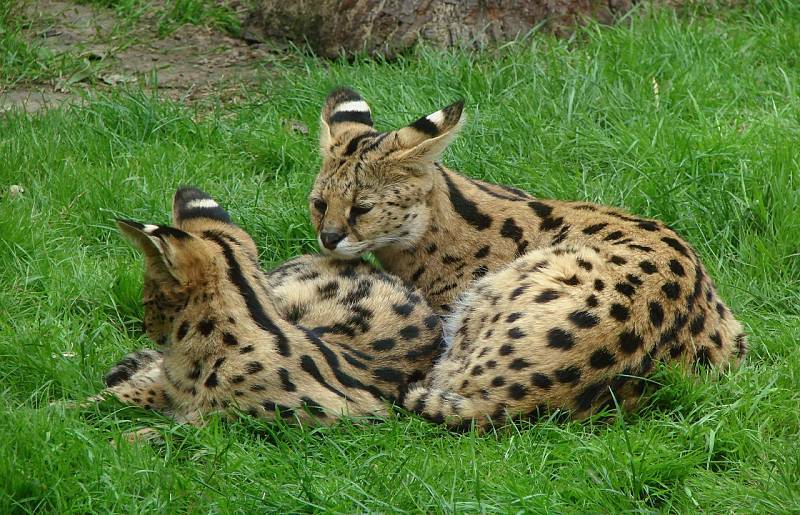 The serval cat is perhaps best known as the wild cat used to create the Savannah cat breed. 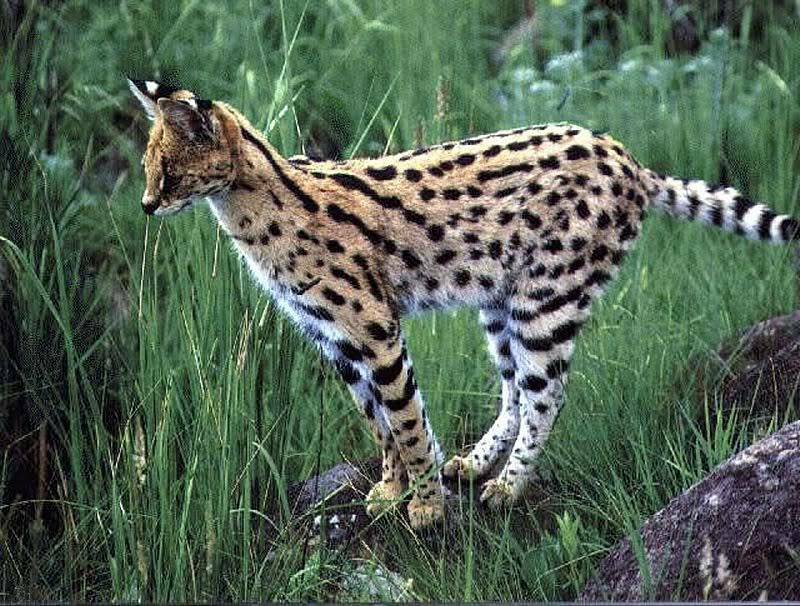 The Serval is an African wild cat that can weigh up to 50 pounds. They look very much like cheetahs and have the longest legs percentage wise, of any cat species. Servals can reach speeds of over 50 miles per hour, but they usually use their long legs for stalking and then pouncing on prey, unlike cheetahs who simply outrun their quarry. 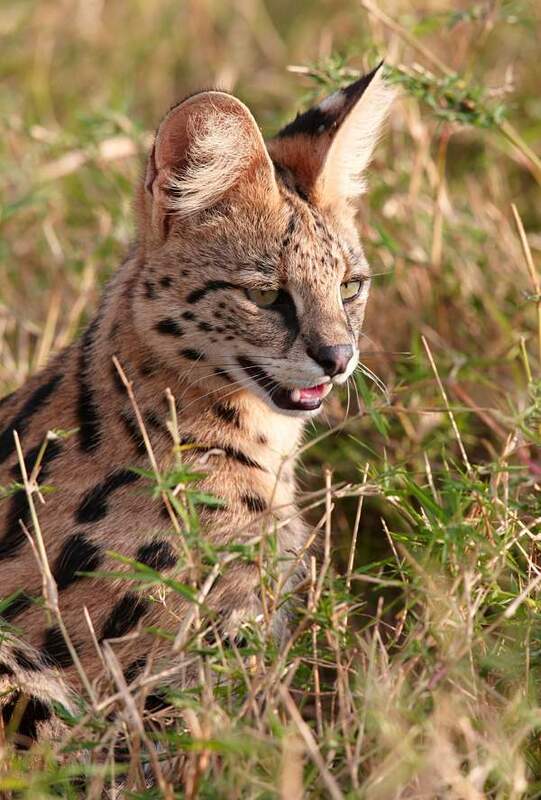 Perhaps the serval cats most remarkable characteristic are their enormous ears. 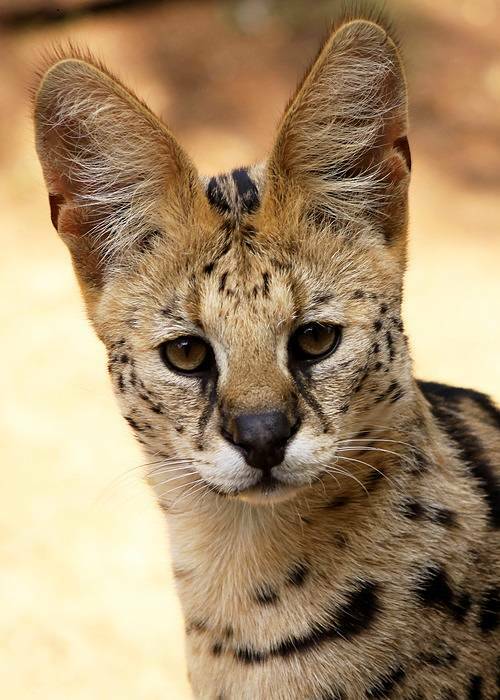 Set directly on top of the head, a servals ears are so large they take up the entire top of the skull. The back of the ears are solid black with a large white dot on each. Servals often find prey by crouching with their eyes closed, just listening with their huge ears. 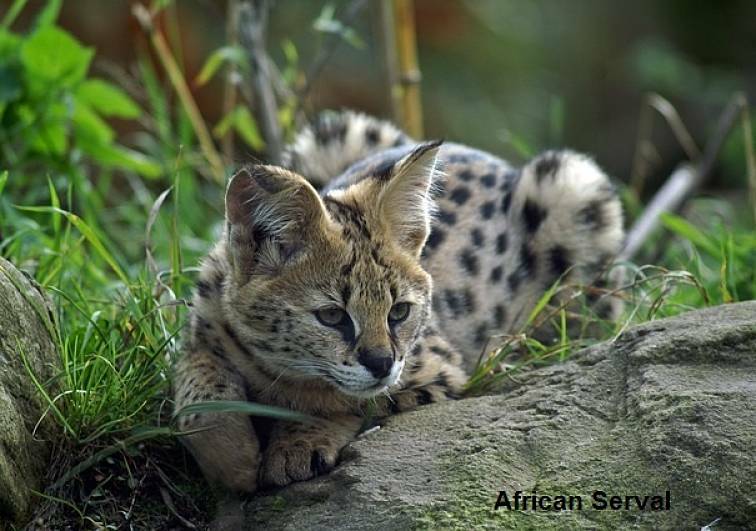 Servals are native to the savanna grasslands of southern and central Africa. They require a heavily planted habitat with a water source such as a lake or stream. They are active at dawn and dusk, hunting in the tall grass for small rodents and reptiles, but are also known to swat birds out of the air if the opportunity arises. The serval cat is capable of a ten foot vertical leap, and witnesses have observed them clearing spans of twenty feet or more. Although they spend most of their time on the ground, they will climb trees to escape predators. Lions, leopards, wild dogs and hyenas all pursue servals, and younger individuals may be preyed on by eagles and snakes. 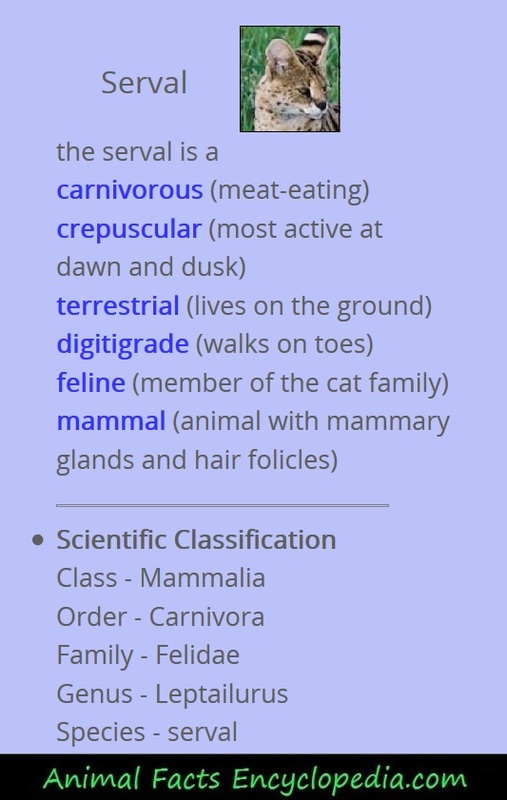 The serval is a skilled hunter that employs several techniques. They will actively trail, wait in ambush or run down their prey and are successful more often than any other cat species - about 50 percent of the time. One of their favorite meals is rat, and they serve to keep the population of rodents down with vigorous hunting. 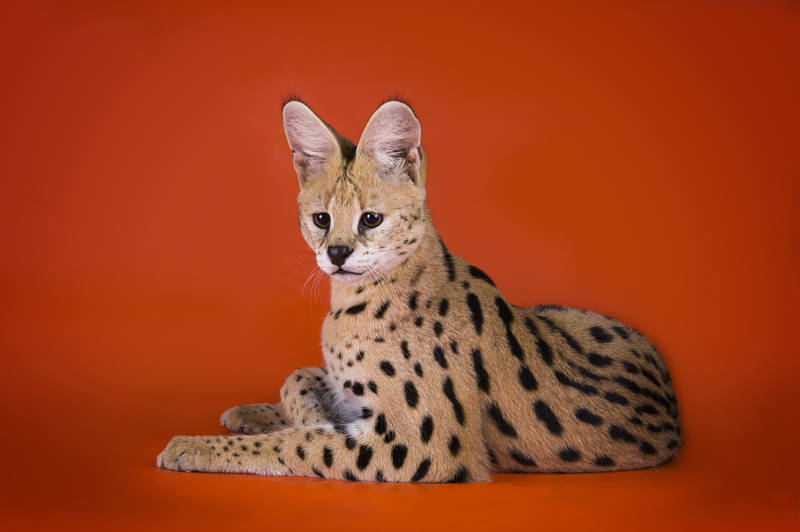 Servals are solitary animals that have large territories they mark along the perimeter. They scent mark with a spray of urine, or leave visual clues by scratching particular trees. Pregnant females do not generally den, but make a nest in tall grass. They almost always have three kittens which are born a grey color with barely visible spots. The kittens change quickly, and within two weeks their eyes are open and their coat has taken on the adult coloring, with a fuzzy top layer. Young servals will stay with their mother for about a year before heading off on their own. Captive serval cats are regularly bred with domestic cats to produce a hybrid called the Savannah cat. Savannah cats are beautiful animals that have many of the features of the wild serval, but a more domestic disposition. Folks also keep full servals as pets, but this requires dedication and experience.